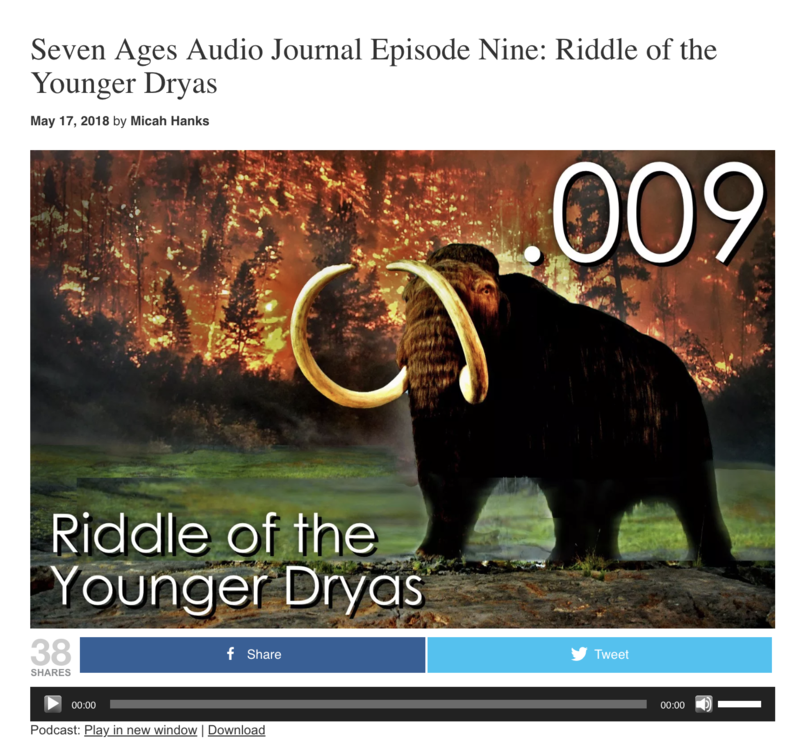 I had a blast last week joining the hosts of my favorite new podcast: Seven Ages Audio Journal. Like the Tusk, veteran podcaster Micah Hanks and his science bros Jason Pentrail and James Waldo attempt the difficult balance between hard science, responsible speculation and perhaps some entertainment. I think they recognized me as a “fellow traveler” in this regard, and were kind to invite me on as a non-PhD generalist researcher of the Younger Dryas Event. But I don’t expect my exclusivity with this podcast to last very long. The Seven Ages team is spending very significant amounts of time in the field exploring sites with the primary, academic Younger Dryas impact researchers. On recent trips to South Carolina they joined Chris Moore and Al Goodyear at their archeological sites and received a first hand look at the relevant evidence, as well being in touch with and well briefed on latest developments by Dr. James Kennett. We can expect Moore, Goodyear, and others from our team to appear over time on Seven Ages. I cant wait. Please take a listen and hopefully you will join the Tusk as a fan of this creative audio endeavor exploring our obscure corner of interest. You will be well rewarded by Seven Ages’ hard work and professional approach to the subject matter.